I find normal basil pesto just a little cloying, so I like the tartness goat cheese brings. It might seem like a strange combination, but this is also good with sautéed strips of bitter radicchio instead of tomatoes. Put the tomatoes in a roasting tin, drizzle with the olive oil and season. Roast in an oven preheated to 190ºC/375ºF/gas mark 5 until they are completely soft and a little charred – about 20–25 minutes. They can be either hot or at room temperature when added to the pasta. Put the basil, pine nuts, garlic, half the Parmesan and salt and pepper into a food processor. Blend, gradually adding the olive oil, then stir in the rest of the Parmesan. Break the goat cheese up and gently stir it into the pesto. Check the seasoning. Cook the fettuccine in plenty of boiling salted water until al dente. 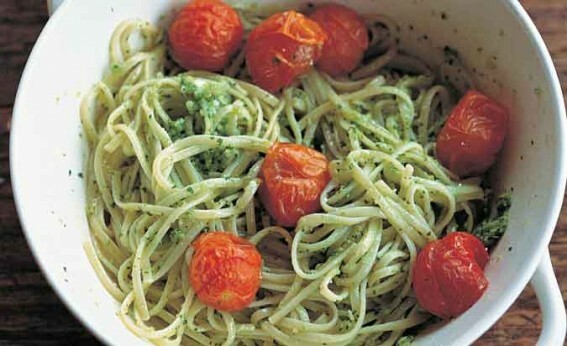 Drain and toss in a warmed bowl with the pesto and the roast tomatoes.